Phoenix Belly Dance is a multi-award-winning entertainment company and dance troupe based in Auckland, New Zealand. We love sharing the art of Middle Eastern dance through our classes, workshops, and performances that fuse contemporary concepts with the traditional roots of belly dance. Candice Frankland, the Director, has had the privilege of performing and teaching overseas, and has been working hard at growing the community and elevating belly dance in New Zealand to be taken as a serious dance form through extraordinary performances, theatre shows, collaborative projects, hosting international teachers and the annual Weekend Belly Dance Retreat featuring Aziza, Marta Korzun, Anasma, Hadia, Irina Akulenko, Joana Saahirah, Jrisi Jusakos, Rose Ottaviano, Helene of Norway and more. We also offer large scale performances by our team of professional belly dancers and entertainers in Auckland for hire at corporate functions, festivals, concerts, and theatre and event productions in New Zealand and internationally. We take care of the hassle of entertaining your guests with stunning costumes, dynamic group and solo dances and interactive fun! Our belly dance teachers are among the best in NZ and we offer oriental and tribal fusion belly dance classes in Central, East, South, West Auckland and the North Shore, in Birkdale, Western Springs, CBD, Ellerslie and Epsom. Our vision is to develop and encourage participation by women and young girls of all walks of life to take part in the art of belly dance by providing regular classes, workshops, and performance opportunities. The relationships developed within the belly dance community, which include students of all ages and abilities, families, performers and teachers, are a vital influence on the success of this growing art form, and are life-changing for those who experience these bonds of friendship. Therefore, our mission is to promote a fun learning environment and supportive performance demonstrations, with pride, passion, and grace. Subscribing allows you to get monthly news updates. Your email address will be kept private. 2019 Retreat Registrations are Open! 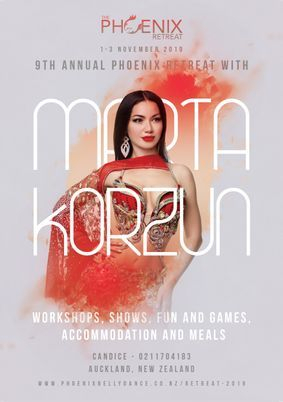 Head over to our retreat info page and find out about our International and NZ teachers at this year's 9th annual retreat with the incredible Marta Korzun as our international superstar, and joining her is Kateryna Siham who is coming to us from the Middle East, or go on and fill in our registration form if you're ready to sign up! 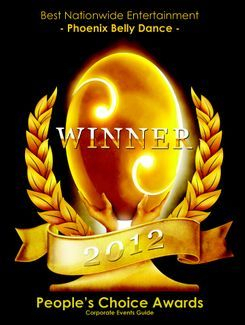 3 Phoenix Teachers among the Belly Dance Evolution Casting Competition Winners! 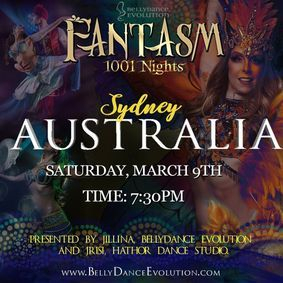 The March 2019 tour for the Los Angeles based Belly Dance Evolution's theatre show, Fantasm, presented by Jillina, went to Australia. Of the winners of the international casting competition, all THREE of New Zealand dancers selected are from Phoenix Belly Dance!! Our Director, Candice Frankland was also cast in a lead role in the show! Looking for some top-quality entertainment for your hen's party or wedding reception? Look no further- you've come to the experts. With several years of experience, glowing testimonials and an endorsement from Wedding Guide NZ, our team of professional dancers are ready to make your event extra special. Head over to our performances page to find out more about our pricing options and packages, or fill out the booking form and we'll get back to you with a personalised quote. We can usually accommodate special requests, so don't hesitate to tell us what you have in mind! Take a look at our brand new performance videos! All our videos can be seen in the videos section of the website, or head to our Youtube channel. If you're looking for corporate entertainment for your company function, whether it's an Arabian Themed evening or you're just looking for professional entertainers to get your party started, we are offering special packages! You can book our troupe of pro dancers for large events, our solo and duet shows for smaller groups, and even fire dancers to give your guests a spectacular show! Click here to find our more about our award winning entertainment packages for companies! Or simply fill in the form to get a free quote.